VMOU 2019 Registration has been Extended till 30th April 2019 for B.Ed Courses. 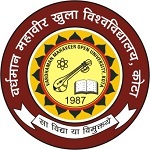 VMOU is referred to as Vardhman Mahaveer Open University it is a university level admission procedure. This process is conducted in January and July by the Vardhman Mahaveer Open University, Kota. Through this candidates can get admissions in UG, PG, Diploma, Certificate and other programmes in the field of management, computer applications, arts, science, etc.by VMOU 2019 entrance exam admission will be done into the MBA and B.Ed programme. Candidates those score good marks in VMOU 2019 entrance exam can get admission in various colleges in a different location in Rajasthan. In this article, candidates can get the complete information of VMOU 2019 Exam Dates, Application Form, Fees, Eligibility Criteria, and How to apply. VMOU 2019 Registration has been Extended till 30th April 2019 for B.Ed Courses. Click Here to Apply. Candidates who are willing to apply VMOU 2019 needs to fill application on the official website of VMOU. Through online as well as by offline mode candidates will be able to fill application. Candidates can fill the VMOU Application form 2019 through offline and online mode. Candidates applying offline mode application have to fill application form along with enclosures will be sent and submit in person to the candidate’s Regional Centre. VMOU 2019 Registration for B.Ed has been Started on 21st February 2019. VMOU 2019 Registration for B.Ed can be done till 30th April 2019 Extended. Candidates have to fill all details in an application like personal and academic details. Authority will send registration number to candidates on their registered mobile number. After filling, application candidates have to upload the scanned images of photograph and signature in the specified format and take the printout of the filled application form at last. Candidates should save all the details after the submission of application. All candidates who are applying have to pay application form fees compulsory. VMOU application fee will be Rs. 100/-. For the MBA application form, B.Ed it will be Rs. 1000/-. The applications fee can be submitted through E-Mitra/Online Banking/Challan only. The application fee will not be refunded in any case. Candidates who are applying should know the full VMOU 2019Eligibility Criteria carefully. Candidates must fulfill all Eligibility Criteria such as Nationality, age criteria, and qualification criteria, etc. Candidates of India and Foreign Nationals can apply. There are no age criteria to apply for the VMOU admission. The VMOU offers many distance courses in the different field, so, the eligibility for each course is different. However, the candidate should satisfy the basic eligibilities for admission. For admission in UG, the candidate should pass or appear in 12th examination from any open university. For admission in PG courses, the candidate should have obtained a Bachelor’s degree in any stream from any open university. Note: The candidates of Rajasthan those belong to the SC/ST/OBC/PWD/Widow/Divorcee female candidates will be provided the 5% of relaxation in UG/PG eligibilities. Candidates who are applying should know the exact dates of VMOU 2019. Exam dates like of Application Starts from, Last date of submission and VMOU exam date etc. Candidates who are interested can fill the application through online mode on the official portal.to easily register application candidates should Follow the procedure of VMOU application form which is mentioned below for candidates. Candidates can get the VMOU Admission Form through online mode only. The applications will not be entertained via offline mode. The application fee varies as per the courses opted by the students. Fee payment can be done through SBI-EPay or E-Mitra portal. For any other queries about the VMOU 2019 Application Form, you can leave your queries below in the comment box. Sir My graduation I have 42% mark can I apply for B ed.